Delightfully dazzling color and touchable texture makes for a lively and refreshing update to your bed. This divine vintage quilt set comes with a bedspread and two shams (one in the twin set) with bold, colorful stripes that reverse to a deliciously rich plum color. We received the twin bedspreads and they look really nice. BUT..... they are two different sizes, neither of what they are supposed to be. They are supposed to be 68" X 88" . One is 65" X 93" and the other is 76" X 89" . I am going to keep them because one of the beds is against the wall so the back side can be shorter. Also don't want to go through the hassle. But, what the heck????? Beautiful! Right out of the box the quilt is soft and ready to use. There was a bit of a "new" smell but was remedied by simply leaving the set out of the packaging for a day or two before placing it on the bed. I encourage you to think about what you're looking for and how your particular bedding choices will be before ordering. We have a queen size bed and the full/queen size quilt just wasn't quite enough for what we wanted. From the floor to the top edge of our mattress is just around 28". If we were planning on a bedskirt or a larger coordinating quilt or spread to go under the Marley quilt, the full/queen would have been fine. However, we wanted a bit more of the Marley quilt hanging down on the sides so we returned the queen and ordered a king. King shams come with the king quilt so keep that in mind as well if you're ordering for a queen bed. I would consider the quilt to be a warm yet lightweight quilt and the stitching appears to be of good quality. The colors are rich and mostly true to the picture shown (the blue is a nice mix of both navy and royal but appears more navy in the picture). I love the bright colors in this quilt, just as I'd hoped I would. Craftmanship is good. Adds so much color to my bedroom! The colors in this quilt are bold and colorful. Nicely made quilt and shams. I like the quilt. It fits our queen bed better with the stripes on the horizontal, instead of vertical as shown in the photo. Will see how it stands up to the dog as time goes on. Colors are good. The cranberry and navy stand out a little more on our quilt than the other colors. My one big note is there are two types of shams shown in the photo. I bought the Sham set thinking that I was buying the purplish looking ones on the back row, but as it turns out the pillow sham set is actually 2 of the exact same shams that come in the set. That was a disappointment because I don't need or want 4 of the same shams for the bed and really liked the ones in the back. Cotton quilt that is lightweight and warm in Arizona weather. My husband likes the colorful stripes. Easy to wash and dry. I buy all of my quilts from Overstock. Easy to order, love the cottons! If the temperature gets too chilly, I throw a down comforter on top, and then remove the comforter in the morning to display the cheerful colors of the quilt. Very pretty quilt, however, after washing, I had trouble making this quilt fit properly on my king bed. I decided to measure it, coming up with 96 x 99....so is it off or did it shrink? I don't know, but it fits oddly. Too bad because I really like it. Really seems cut for a cal king. update: The shams are falling apart in the back in less than a year. Hesitant to purchase a different quilt from this manufacturer. Colors are bright enough to add color to a room but not so bright that it's obnoxious. I really love it. The thickness is also good, medium. The quality of the product is great - all cotton is almost "a rare find" nowadays. However the picture is very misleading due to the angle from which it was taken. You would expect, looking at it, that the red stripe will be repeating at least 4 times. Wrong! There are a total of two red stripes, both at the edges. The middle is grayish - "very sad!" The orange is totally mute, not bright, as it is on the picture. Plus there is a strong "intervention" of the white pattern on the stripes, which is not obvious from the picture due to its small scale. Misleading color representation. Had to send it back. Overstock customer service is second to none: They accepted the return free of charge. That is what keeps me Overstock's loyal customer. i bought 2 of these to fit a king bed - no more competing for bed covers... we have our own now. i like the weight of these spreads, and the colors are beautiful - since i bought the twin sizes, the pillow shams that came with them are standard - i may purchase the king size shams... did not think that one through.. i washed them prior to placing on the bed, and there was minimal color bleeding - i was concerned about that.. the stitching is real and NOT decorative. a great purchase. This quilt is a carbon copy for the picture listed. It turned out beautifully and the colors really brighten up the room. Thin summer quilt. Colorful and perfect if you have furry friends. Very nice set! I was looking for something with some color and couldn't be happier. I have had this quilt set for nearly a year now. First let me say that the colors in the photo are true. They are very vibrant! It is just the right weight. It can be used in the summer, but you may find it a bit warm. It does quite well in the winter as well, but I do add a blanket, but I get cold easily. But here is the best part... I let my dogs sleep on the bed with me, and my little one likes to scratch about until he finds his place, but, the quilt has not ripped. Also, I wash it OFTEN, its colors are nearly as vibrant as when I first got it! You can't ask for better than that! I absolutely love this Greenland Marley Oversized Cotton Quilt!!! It’s my second one to purchase and if it wears out I will purchase a third one. It’s rich colors go well with any decor and it’s engulfing designs envelopes any room you could ever choose to use it in. The depths of colors as well tend to help bring a smile to your heart after a long day of work day after day. A wonderful quilt for a wonderful soul!!! We bought this many years ago, and it has held up really well. The colors are bright and cheerful and it's just the right weight for all seasons. Beautiful blanket. The colors are as pictured. 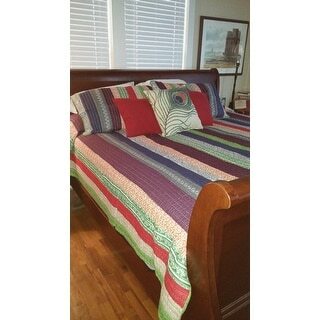 We are very happy with this purchase, it was a great price and the quilt is exactly what we expected. After one way the colors have remained vibrant and soft. We are so pleased with this purchase as well as the matching throw that we ordered to toss over an armchair in the guest bedroom. There was no odor, the fabric was soft and the colors bright. It’s well made and generously sized. I did wash both in cold water before using and the colors run a little. If you do the same just be careful to wash theses products separately. Completely disappointed. Wanted the bedspread to hit the floor and it doesnt, when the descriptions calls it an oversized. Should tell you to go up to the next size up if you want that look because the picture they show you is deceiving and with the return policy and charging you for the return I am sticking with *** from now on. I loved the color and feel but after first wash I noticed distressing on seams, very dissapointed. Very nice oversized like the ad said. "Do you have curtains in a solid or matching pattern to go with this set?" "Are decorative pillows available to purchase?" Unfortunately no, decorative pillows are not available at this time. "Is it oversized where i wont need a bedskirt"
No it isn't. I have a queen and it just covers far enough to have with a bedskirt. I purchased the queen. I have a thicker Tempur-Pedic mattress. The quilt falls to a little below the top of the bed skirt. If you are ok with bed rails showing and under bed showing, it should cover the mattress and boxpring. Hope that helps. "Does the king size quilt come with king size shams?" Yes,the King size comes with a King size shams. "Is this a pieced quilt or is the design just printed on?" "Is there a way to buy the solid purple shams and the accent pillows shown in the picture?" It is a 3 piece set. 2 stripped matching shams come with the quilt. As for the solid, I don't know where they came into play. You would have to search for solid shams and order separately. This was a gift for my brother and he loved the quilt. I don't think he has even used the shams yet. "Also, I'd like to know if & how to go about getting any decorator pillows, as pictured.???? Thanks jsmithw"
I saw your question about the Shams and accent pillows. Did you get a response or find them?